Longshot is an artificial humanoid lifeform created on Mojoworld (from the Mojoverse). He, like all the slaves of that dimension, is ruled by over by the Spineless Ones who themselves are typically ruled by Mojo. Mojo’s head geneticist, Arize, gave Longshot and his other creations free will and a conscience, in hopes that they would one day rise up against the Spineless Ones. When the rebellion finally comes, the Spineless Ones are able to overcome the mystical luck charm the rebels gave themselves and Longshot is rendered an amnesiac while fleeing from Mojoworld and landing on Earth. Unable to remember his real name, Longshot becomes an adventurer and adopts the moniker, “Longshot” after several humans call him that because of his incredible luck. It is during this time that Longshot meets Ricochet Rita and works as a stuntman. Eventually, Mojo and his six-armed bodyguard Spiral arrive on Earth in pursuit of Longshot. Longshot, alongside Rita and Doctor Strange defeat Mojo and send both he and Spiral back to the Mojoverse. Longshot and his allies, sans Strange, then follow to free the other slaves. This rebellion also fails and Longshot is again sent to Earth by Mojo, without his memories. Again. This time he joins the X-Men and helps them battle the Juggernaut, the Marauders, the Adversary (where he dies and is then resurrected with the rest of the X-Men), the Reavers and the Brood. Longshot eventually falls in love with Dazzler but suffers an identity crisis and leaves both her and the X-Men as a result. Dazzler eventually reunites with her lover and the pair are teleported to Mojoworld. They are eventually captured and then lead a revolt alongside the X-Men and Mojo’s one time successor, Mojo II: The Sequel. During this time the couple also care for the X-Babies and learn that Dazzler herself is pregnant with their own little x-baby. Dazzler is eventually returned to Earth along, with her memories altered to believe that Longshot, the X-Babies and other members of the rebellion had all been killed. 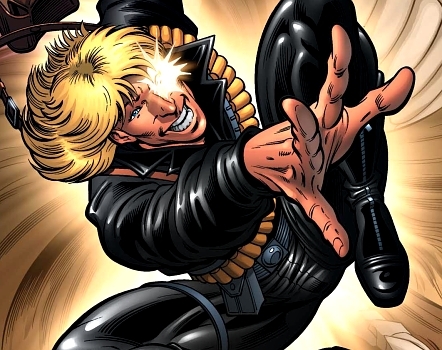 Longshot is eventually recruited into the Exiles by Heather Hudson to help battle Proteus. Mojo claims that all the members of Mojoworld are unique and do not have other dimensional copies, which he feels makes them more important. Morph explains to Longshot that his luck powers can cancel out Proteus’ reality warping powers, which makes him an ideal candidate. Longshot is a great help to the Exiles as they battle Proteus across 2099, New Universe Approximation, the Maestro’s future, and the Heroes Reborn world. Together, the team are able to trap Proteus in Morph’s nigh-indestructable body and put an end to the reality warper’s threat. Longshot decides to stay on the team, however, and keep helping fix damaged realities. He only eventually leaves the team when he meets Longshot on Earth-616, even though he has no memory of his former lover. Longshot eventually ruins into X-Factor and helps them find the Karma Project. At this point, his memories are so damaged that he no longer understands how his powers even work.